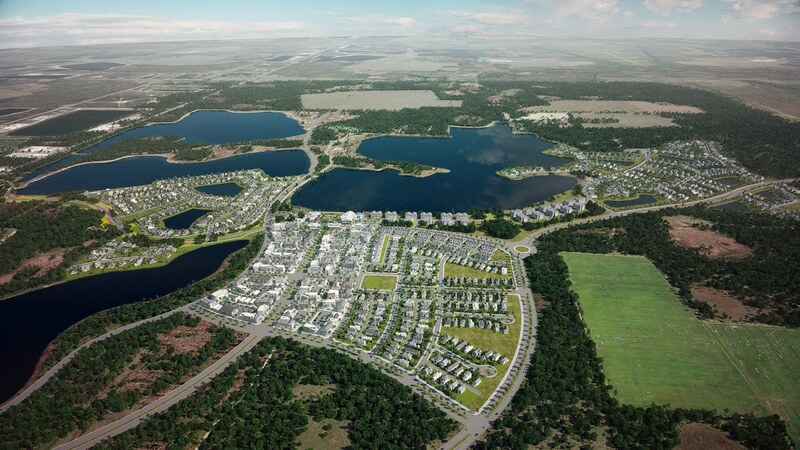 In southwest Florida, the greenest community in America is under construction. 10 years ago, real estate developer Kitson & Partners purchased a large tract of vacant land ten times the size of Manhattan on the banks of the Coloosahatchie River east of Fort Meyers, Florida. They immediately sold off 73,000 acres to the State of Florida and Lee County to be left in its natural state in perpetuity. That’s the part that got them the land in the first place: their offer was lower than several others, but the seller was impressed with their commitment to protecting much of the land from development. Now, Kitson & Partners are about to begin building a brand new community on the remaining land. But it is not going to be just another Florida community — a collection of condominiums as far as the eye can see. The new town will be called Babcock Ranch and it is designed from the beginning to maximize opportunities for walking and bicycle riding. The homes will be close to the commercial center. There will be dedicated walking and bicycle paths that do not compete with vehicular traffic. Babcock Ranch will also be powered largely by solar power. Florida Power & Light is building a solar farm comprised of 350,000 solar panels. In sunny Florida, they will be produce enough electricity to power a community of 50,000 people. FP&L uses natural gas to run its nearest electric generating plant. In total, Babcock Ranch will have some of the greenest electrical power in the nation. Kitson & Partners have other ideas for making their new community green. They are planning to use autonomous driving cars and a ride sharing app similar to Uber or Lyft. There will be no public transportation system, as such. They are currently working with a company to build out that system, taking advantage of new legislation that makes Florida one of the most autonomous-friendly states in the country, according to Gas2. Babcock Ranch will also be a living laboratory for other technology. Houses will have tele-health systems built in, and graywater recycling infrastructure will be standard. Beyond the residential and business areas of the town, the surrounding land will be restored for wildlife or recreation. Seventy five acres of former farmland will be restored as a habitat for panthers. Over the last ten years, wetlands and other waterways have been partially restored. Crayfish, native birds, and native plants have returned to the area. Source: Fast Coexist. Image credit: Kitson & Partners.